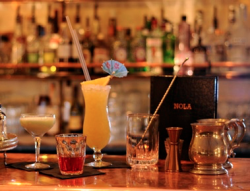 The brainchild of industry legend Dan Priseman, Nola is a little bit of New Orleans in East London. So it embodies the two things New Orleans is most famous for – music and damn fine cocktails. The drinks menu has been created by Priseman himself and is inspired by the long history of cocktails dating back to the 1850’s. Natch we’re loving the classics so keep those Ramos Gin Fizzes and French 75s coming. Add in the speakeasy atmosphere, live jazz and blues at the weekends, a cigar menu, Southern style bites and a really attractive smoking terrace and it’s easy to see why NOLA has become a hangout for the drinks industry. After midnight it’s members only but membership is free, you just have to be a nice person.